We parked next to a lone car in the lot, and, once inside, wound our way through the seemingly empty church to find the door to the basement. 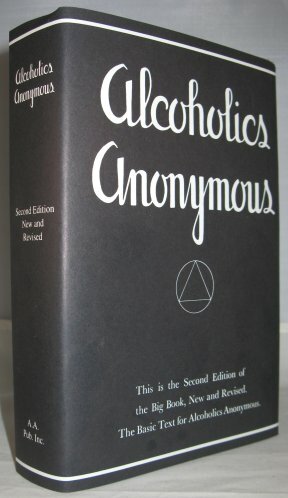 I hung close to my friend, my guide to the world of Alcoholics Anonymous. I wanted to know what AA was like, what his new life was like, so I had asked if I could go with him to a meeting. I regretted the outing as soon as we found the room. I had pictured rows of folding chairs, half filled with reluctant people clutching coffee cups and coats. I had pictured myself in the back row, at a friendly, supportive remove. But we were the fourth and fifth people there, and we draped our coats around chairs set in an intimate circle. I smiled nervously at the other three people, wondering what I would say when it was my time to address them. “Hi, I’m Kate, and I’m ———–”? Oh, good: two more arrived; now we were seven. Nine. Ten. At the last minute, the circle filled, and there were twelve of us. AA, as you probably know, uses a twelve-step program of recovery. The first thing we did, after the opening welcome, was to read these steps out loud, one by one, from a photocopied sheet in a plastic sleeve, passing them from person to person. When my friend handed them to me, I handed them right along to the fellow on my right. As a visitor, I didn’t feel like it was my place to say them. As an atheist, I didn’t think I could. I had known before I came that AA asks its members to give over control of their lives to a Higher Power, and I figured there’d be a God-related step or two. But I was wrong: six of the twelve steps center on or at least refer to God. He doesn’t get that much ink in the Ten Commandments. Then it became less about God and more like church. We passed out copies of the Big Book (Alcoholics Anonymous, the AA “bible”), fat hardbacks with black covers, fetched from a little cabinet under the coffee maker. After some discussion about where the group had left off, we settled in to read “Stars Don’t Fall,” a testimonial by Felicia G., who drank her way through the 1940s before eventually grasping sobriety. As we read her story aloud, turn by turn, paragraph by paragraph, we were, implicitly at least, tasked with finding commonality between her story and ours. It wasn’t easy. Felicia wasn’t just from a different era (in which one went to “gin mills” to get “tight”); she was from a different life entirely. She was born in a castle, had a chalet in Switzerland, and kept a house in Virginia “during fox hunting season.” She knew how to hold a terrapin fork. I wasn’t sure what a terrapin was. Other girls whom I had known all my life asked for one weak scotch after dinner. Sometimes they’d put it on the mantel, and forget it. My eye would be glued to that glass. How could anybody forget a drink? Ah, God. And yet she describes very clearly who was looking after her: Bill and Marty and Priscilla and John and Bud and so on. Looking around the room at these people patiently listening to each other, serving each other coffee and cookies, passing information from hand to hand, and ultimately—in the few minutes left after the reading was over—sharing their stories with each other, it struck me once again that the “Higher Power” is really just human power in disguise. It makes sense: the idea that Something is in control takes the sting out of the realization and admission that you are not. But focus on a Higher Power is really a benign and brilliant feat of misdirection: Look—over there—that will save you, that will hold you steady—and, while you’re looking, here, take my hand . . .
My point is not that Bill didn’t believe or that these people don’t, in one way or another. Even my friend, an atheist like me, was trying to figure out whether he could at least make the switch to agnostic. My point is that Higher Power, whatever it may be, is not the source of their salvation. My friend had been sober about a hundred days; his phone was filled with new numbers: other AA members he called to check up on, and those who called to check on him. His calendar was filled, too, with meetings and assignments from his sponsor. AA puts you right to work: someone has to make the coffee, run the meetings, give literature to new members, “qualify”(or speak at length about one’s experience), and eventually sponsor others. “Do you think that you are one of us?” Bill asks Felicia when they first meet. Saying “yes” included her instantly in a network of people who help one another. That’s it, I thought: that is what is saving my friend. As we read, the man to the left of my friend seemed repeatedly confused and unable to find his place in the text. Fearing he was drunk, I tried not to stare. No, that’s not right: I tried not to look. But my friend leaned over to help and discovered the man had a different edition of the Big Book than the rest of us had. So my friend gave him his book and then the two of us shared mine: I put my hand on his shoulder so I could lean in to follow the reading. And I found that, weirdly, once my hand rested on my friend’s shoulder, I could not remove it. Not for the rest of the meeting. Maybe I was offering him comfort and strength, or maybe it was the other way around. I want my scholars to know that even if they live in a housing project, they are part of a royal lineage going back to great African kings and queens. They belong to a group of individuals who invented astronomy and math. And they belong to a group of individuals who have endured so much history and still overcome. When you tell people you’re from Brownsville, their face cringes up. But there are children here that need to know that they are expected to succeed. Thanks to Humans of New York, in fact, everybody knows about Ms. Lopez—you (I’m guessing) and I and Ellen DeGeneres and President Obama. And thanks to Lopez’s own inspirational work and the human need to be inspired and then (once inspired) to act, Vidal has sat behind the desk in the Oval Office, and Mott Hall Bridges has received more than a million dollars in donations. For all of this, Lopez gives thanks to . . . God. I was ready to quit, I was ready to resign, I was done, and my mother told me to pray on it . . . I did pray about it Monday, and God showed me how much of a significance I was, not only to Vidal but to people around the world who could identify what it was like to know someone who was their champion and pushed them through. I don’t want to minimize the range and intelligence of her statements on education and community and poverty, or reduce her to a football player who believes God kicked in the extra point. She has much more to say than this. But I do think it’s striking that here, in a situation where cause and effect are transparent, God gets credit. It’s not like $1 million showed up on the doorstep, or that people started sending in checks for no evident reason. To conclude that what happened to Lopez and her school was God’s work is to minimize not just what Lopez herself did but also what Stanton did, what people moved by the story did. I’m sure no one involved, least of all Lopez herself, feels the need to get credit. But minimizing the human role minimizes human responsibility. 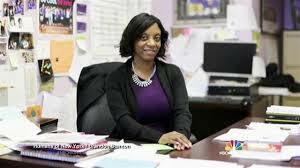 We may not want to admit it, but we have the power to save not just Vidal and Mott Hall Bridges but all the schools that struggle to keep kids afloat in impoverished areas. We have the power to end poverty. We have the money; we have the will; all we lack is the certainty that it’s our job. That what controls the circumstances of one human’s life is other humans—not just personally (that part we understand), but in the systems that we create together. If we as a culture believe a Higher Power is in charge, we’re simply not going to use our human power to its fullest. We’re going to think that poverty is His doing, not ours. I could write about these events to demonstrate the dangers of religious belief. Many people have. But the problem with using such extreme examples is that we can all be horrified, appalled, and disgusted by them without fundamentally questioning anything we—or non-murderous, non-sexist, non-stupid people like us—believe. Today, on Darwin Day, it’s worth asking whether the good kind of religion can have negative consequences too. Whether religion that clearly means no harm and even inspires admirable people like Ms. Lopez to do good might ultimately still be holding us back as a society. When we talk prayer rather than politics, we perpetuate the belief that humans are powerless to address deep-seated societal problems; that the future of kids like Vidal is in God’s hands. But it’s not. It’s in Lopez’s—and in ours.